Whenever there is a discussion involving India and Pakistan then there has to be growing animosity between the people from the two countries which basically transforms into a heated argument. 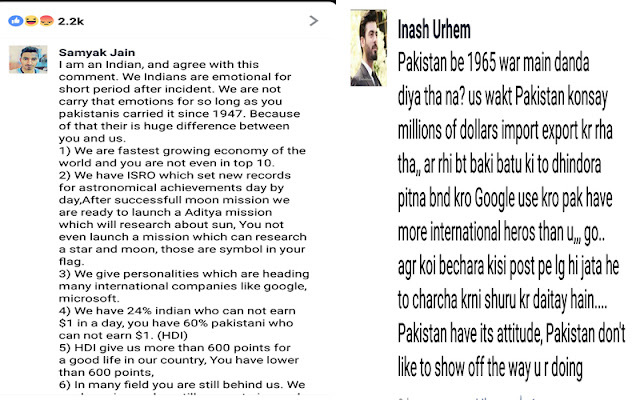 I have recently noticed that the Times Of India Facebook page consists of more Pakistani users than Indians. The increasing rise of Keyboard warriors totally gives a different perspective. Keyboard Warriors are basically netizens who spent most of their time online expressing their views on topics that need much attention. It may be economics, finance, terrorism, politics and god knows what not! The increase in the population of Keyboard warriors only reveals the power of the Internet and social media. Social Media plays a major role and majority of the younger generation can be found expressing their views and thoughts on the Social Media. They are the ones who readily give advises without a proper research or citing relevant sources. The outcome of frustrated Keyboard Warriors results in trends such as #KamjorIndia #BuzdilPakistan #FreeKashmirFromIndia #CowardIndia and such trends. Their involvement in such kinds of twitter trends is phenomenal. The inability of Pakistan to control terrorism is disappointing and it is serving as a breeding ground for Terrorism. The recent infiltration attempts by the Pakistani militants and the attacks on the Indian army men only strengthens the point that Pakistan is a major player when it comes to Terrorism. It is the primary reason for the growing tension between the two nations. The blame game between India and Pakistan is never ending and won't cease to exist. That is because of the sentiments and emotions attached with the two countrymen. In India, whatever Pakistan is doing is wrong and India needs to pay attention to it. Similarly on the other side of the border, people there have similar views about India. 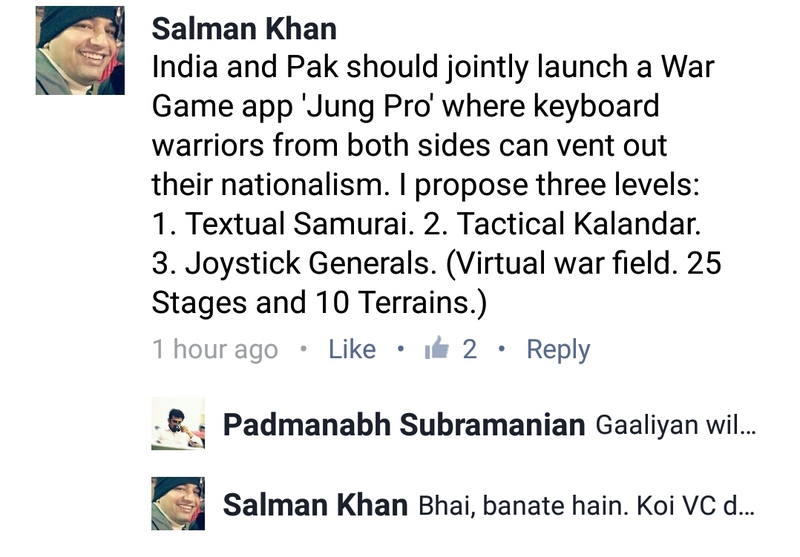 Let's come to the main discussion about the Keyboard warriors from across the border. The Indian and the Pakistani Social Media soldiers are actually smart because each of them knows how to respond well. Not to forget the numerous abuses that are hurled during the process. You might get a clear image when you read the comment section of the Times Of India Facebook Page. That serves as the best example. Every time when I bump it, I am flabbergasted. So many views and some of them are legitimate and valid. That is the speciality of the keyboard warriors. They give good suggestions and advises to the Government and help them in the decision-making only if someone actually pays heed to their words. Recently the Nawaz Sharif speech at the UNGA attracted many eyeballs across the nations. Most of the speech seem to have been dictated by the Pakistani Army because it only had the Kashmir issue described in details. That was expected out of Pakistan because it always played the victim at international level and would stoop any low to bring India down. In response, the Indian diplomat's counter speech was brilliant. But again that actually was a food to many Indian news channels. Arnab Goswami went ahead with his own set of Ex-Generals and Ex-diplomats and did his best to defame the other country. Well, that's obvious. Wrong is Wrong and Wrong cannot be Right. That's the policy I follow. The growing battle between the twitterati's from both countries in Twitter gives so many views to the topic. 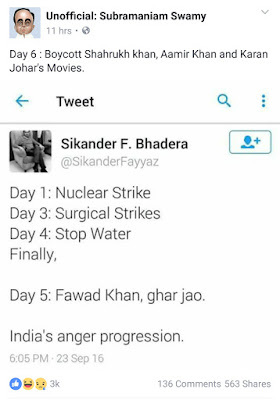 That itself is an Indo Pak war in itself - The Great Indo Pak Twitter War! The recent URI Attack provoked many Indian minds and put the keyboard warriors to work. Their desperate attempts to bring each other down is commendable. Only if they put so many efforts in real world non-trivial things then they would have risen in ranks and positions in their life. But sadly expressing views in Twitter is not going to do good to them. So, after the attack that snatched 18 Indian lives, many of us got angry on PM Modi. Many even labelled him as weak and loose canon. Because most of them wanted a war against Pakistan. Indian Government was hinting at tackling it diplomatically by isolating Pakistan at the international arena. War is never going to happen because if it happens then it would be a destruction of both India and Pakistan. Both are nuclear powers and we all are aware of what happened at Hiroshima and Nagasaki many years back. An India-Pakistan nuclear war could take as many as 18 million human lives. Pakistan could disappear from the world map. Also not to forget the impact it would create on the environment because of the radioactive elements. It would destroy the children for the next 40 years to come. Keyboard warriors should never get emotional without thinking about the outcomes of a war. Firstly ,understand the meaning of a war in its true context. It is easy to ask the country to go for a war without thinking about its consequences. Think Rationally. 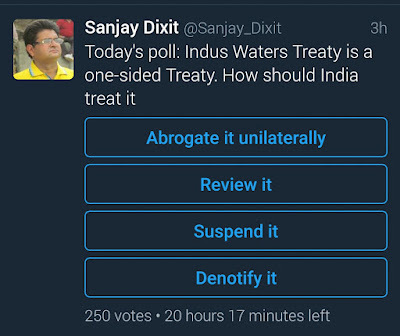 A senior IAS officer threw a poll for the same that attracted users from both the countries. It was whether India and Pakistan should go for a war. He has been creating too many polls related to the present issues. . His poll creation spree seems never ending. 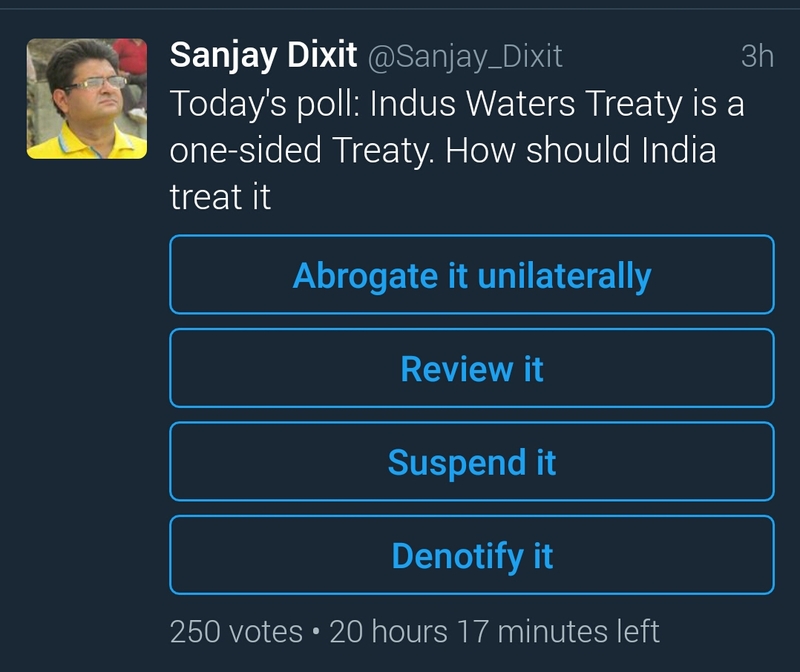 His recent poll is related to the Indus Water Treaty. That is how certain Keyboard Warriors are showing their presence. After Keyboard Warrior's anger subsided, they started a discussion about the possibility of blocking the Indus Waters. It is to be noted that Indus is known as the lifeline of Pakistan as it is the major water source of Pakistan. Blocking the Indus water will create famines and droughts in Pakistan thereby killing many million Pakistani's. This will be more dangerous than a war but in either case, it is the innocent civilians who would be losing their lives. It could be seen as a Humanitarian issue and could bring a bad name for India at the Global stage because Pakistan would play a victim again. So after that, we took the issue of liberation of Balochistan. There is a secession movement happening in Pakistan where Balochistan wants to establish itself as an independend country. Many of the Indian Keyboard warriors believe that Balochistan will be the next Bangladesh. And India will help in its freedom. The same views are snapped by many Pakistani Keyboard warriors. Then came the issue of not giving opportunities to Pakistani artists. Fawad Khan, Ali Zafar, Rahat Ali Khan , Atif Aslam are few known Pakistani artists who have been performing in India. The recent Uri Attacks made many warriors think why these actors didn't condemn the attack. So , there are many tweets and blogs that talk about this. Dear Keyboard Warriors, we all have an important role here. It falls in the Media sector so it's our job to ensure not to spread hatred and false information through the social media channels. I clearly understand that the people from both the countries are bounded by emotions. Who will like it when your army guards are killed. Any country would think twice when there is a threat to the country. And it would not be wise to get emotional under such circumstances. There are many Keyboard Warriors who have been planting false stories. Let the government do the job. They are our voice. PM Modi better understands what is the best - be it a war or cutting Indus waters or diplomatically isolating Pakistan. Let the government take its stance. It will do the best and we as citizens of this wonderful nation should abide by it. Because our leaders job is to ensure that our nation and its people are safe. If any external force happens to destroy the peace and people of our country, then the government would take stern actions. I am quoting my friend Padmanabh's Facebook status here. His status inspired me to write about this. "Dear Governments of India and Pakistan, you may be aware of the rising Keyboard warriors from both the nations. who are desperate to fight it out against each other and prove their worth. They understand terrorism, defence, politics and economics very well. Please get a social media survey done ASAP, provide uniforms to these unsung heroes. Do not allow them to go waste. In fact, you could consider some of them for the Government Portfolios as well since they claim to understand in depth about Government and policies. And above all , replying to opinions with Abusive Language is one of their USP's. Make sure even this talent gets its due credit"
This is such a fantastic slap on the face of "arm chair" crusaders!! JUNG PRO!!! :D seriously some people need to rise up above these 'ban cricket match with Pak', 'ban Pak artistes' politics. Enough buffoonery going on instead of anything practical or serious steps! P.S. putting your advices to use.